Camp Loopy is starting soon! This is the time of year where I buy yarn pretty much every month, and I actually finish things. The first project is 400 yards and it has to remind you of a character or scene or anything from a favorite book, movie or TV show. I know exactly what I want to make. Last year when I was still in Boston, I would go to Gather Here each knit night, and one of the local knitters was doing Sock Madness. She made these socks (rav link) and they were awesome. They looked fun to wear, and they looked fun to make. And better yet, they remind me of something I would think Elizabeth Bennet would wear. Fun to make has changed a lot in the past 6+ months. Now fun to make means simple, easy to put down, and easy to remember my place. It does mean that I've been doing a lot of stripes, very little patterning, almost no shaping. It will be nice to take a bit of time over the summer to try and move back to more complex patterns. I finished my Color Affection Saturday morning. I wove in the ends on the train as I headed to Gather Here for some quality knitting time. Tuesday I decided to dump everything on the day bed onto the floor (only sort of a joke) and I blocked the shawl. It took up the entire day bed and over the edge against the wall. It is also a really easy knit. Unlike many knits I've done, this one didn't require that I be completely sober, or even awake. It is a great party knit if you, like me, need to do something with your hands to keep you away from the food trays. Victor approves with a single paw and a stay. I understand that such a bandwagon knit (like Monkey, which I've made, and Clapotis, which I have not) is not necessarily everyone's cup of tea, but this project does has a few things going for it. 1. It is huge. It is big enough to wear wrapped around your shoulders without a shawl pin, leaving your arms free. While I love the shawlettes, so many of them do not stay in place without a little outside aid. 2. It's an opportunity to play with fun colorful yarns. While mine is a study in solids, this would be a great spot to take a couple of mostly solid yarns and some wild variegated yarn that would look bad in cables or lace. 3. While the rows do get huge, because it is garter stitch rather than stockinette, it is quicker to get those huge rows done. 4. It's fairly affordable. It's 3 skeins of sock yarn, but I'm pretty sure I have enough of all of the colors to do another one as long as I make the blue the main color. 5. It's quick. Mine took me 20 days. I knit other things during that time. I was at Squam, so I took classes and I certainly had some weekend days where I didn't even take the knitting out of the bag. Mine was knit with Heritage Silk in Mango and Silvery Grey and the Loopy Ewe solid series in Teal (this is my Camp Loopy project 1). I did knit the short row section too long (1 extra repeat), because it wasn't clear to me from the instructions that the short rows didn't go all the way across. However, you could actually if you preferred it for the look knit the short row section all the way across and be perfectly situated for the solid section at the end. It is a very flexible design. I'm happy with it, and that's a good thing. I have yarn from The Woolen Rabbit for making a second one of these sometime maybe in October when a little more warmth and variety will be a very good thing. It feels like forever since I posted. I've been busy. I auditioned for The Sorcerer. I requested that they make me a man (with blond hair and a tan...), and voila I am a member of the Men's Chorus (Tenor 1). We had a sing through on Monday, which proved that this was not music I had listened to incessantly. We had rehearsal on Wednesday where the tenors rocked (no, tenors are not conceited) as we learned a good amount of the music including the song that implies that love potions are made of distilled essences from demons and hags. WTF. I know Gilbert was a man with issues, but if you ever wanted some additional evidence that he didn't think much of love, marriage or, well, people. Here, have a Sorcerer. I also have picked up Music Studio Lite (if I really love it, then I will upgrade to the full version), which lets me plunk out my notes on the piano, so I can practice. My sweater for Camp Loopy (project 3 baby!) needs to be done tonight. Thankfully I do not have any rehearsal and barely have to show functionality tonight. I have 8 buttons left to sew on. I also have grosgrain ribbon, but I haven't decided if I really want to add it yet. I was going to bring the sweater to knitting on Saturday and ask for advice then. So, expect pictures tonight of a finished cardigan. It isn't bad for a month of work at all. Mittens of Majesty: These thick woolen gloves do not restrict the wearer's manual dexterity. They generate a continuous endure elements effect which protects from the cold only. They also grant a +5 competence bonus to Diplomacy and Knowledge (nobility and royalty) checks. Finally, once per day, the user may use mass suggestion as an 11th-level caster (Will DC 19 to resist). Moderate abjuration and enchantment; CL 11th; Craft Wondrous Item, endure elements, mass suggestion; Price 87,780 gp. 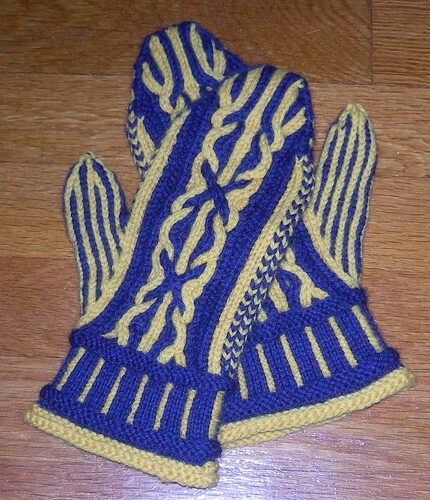 My husband has been calling these mittens of magesty as I have been working on them for their complicated-looking pattern, and their purple and gold color. I started these mittens closer to the end of July than I would have liked, because these were for Camp Loopy project 2. I was busy trying to clean up the last of the knitting for my husband's sweater. However, last Thursday (August 4), I finished the first mitten at the Pints and Purls night at Gather Here, and immediately cast on for mitten 2. The second mitten took me until Saturday evening to finish. The pattern for these looks complicated, but in the end these are very simple cables combined with the simplest of colorwork. If you were afraid of the cables, you could get an awesome impact just doing the stripes on the front and the tweeding on the back. These mittens were my first colorwork project since taking the class with Mary Jane Mucklestone at Squam. These make me ridiculously happy! This pattern by Pamela Wynne (I've also made the February Lady sweater) is awesome. The instructions are clear, the charts have a good legend which makes following them simplistic. The hardest part of this project are the first few rows of the color pattern, because you start the thumb chart and the cable charts at different times. I have yarn to make at last one more pair of these (though I do not know if I have enough yellow left for a second pair). I'm participating in Camp Loopy, which is a fun KAL sponsored by The Loopy Ewe. The first project is supposed to be finished by July 15 and posted to their site. Well, I finished the knitting over July 4th weekend, but it took until yesterday to finally weave in the ends and block it. Yeah, I'm a bit slow on the finishing. I had a hard time taking pictures of this project. It is a shawl. I'm home by myself wearing an old racing T and have no desire to put on a nicer shirt just for the photo op. The camera, battery guzzler that it is, has no batteries and I don't remember where we put the rechargables. So, I took the pictures with the iPad, sent them to myself via email, and did my normal Flickr routine with them. Thank goodness that the iPad has a camera on both sides. It made this task 100% easier, though I don't normally want to splash the Intarwebs with my mug shot. Sweetly Worn by Natalie Selles is my first striped shawl. I bought the pattern (and far too much yarn) at the market night for SAW. I had seen one or two around the workshop and they were all attractive and very comfortable. There is one thing I wished I had done differently: make bigger loops at the color changes. When I was blocking it out, because my blocking surface wasn't big enough I folded the shawl in half along the center increase line. The two wings of the shawl did not line up however. My loops which felt generous while I was knitting the project were not enough to allow it to stretch to the same extent as the other side. It is a fairly big difference when you are blocking it or just sitting it on a chair, but it is subtle when you are wearing it. I made mine is Cascade Heritage Silk (the yellow) and Hand Maiden Swiss Silk in Melon (oh my the deliciousness). It reminds me of summer sunshine, and pink grapefruits and lemons. I love that my "neutral" color isn't white or black or grey, but something cheerful. It may not match anything in my wardrobe ever, but I don't care. It's why I wear black afterall. Project 1 is in my bag, waiting for me to finally weave in the ends. However, I have been thinking about project 2 (mittens, gloves or socks with cables) for over a week now since Sheri first announced the project. I wasn't ready to leave behind 2 color knitting and I've been looking for a doable project that won't be too time consuming, so I can work on other things too. I think I have finally found it. 2 color cabled mittens from the February Lady lady, Pamela Wynne. 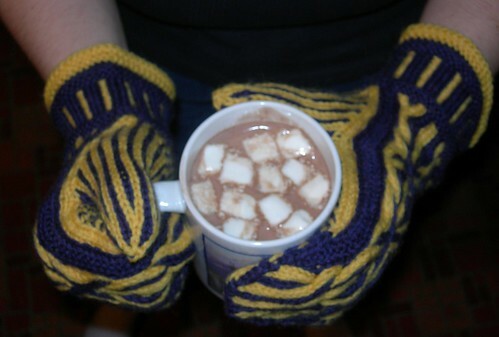 They are made of awesome and the world needs more fun mittens. I just placed my order for enough yarn to make 2 pairs (sounds decadent, but hey Cascade 220 is super affordable). A purple and yellow pair for me and a Black and yellow (well, goldenrod) pair for my Hufflepuffer. I might attempt to make one of the pairs convertible, but I am often cold enough that I will simply wear a pair of gloves underneath regardless. In other news, I finished the front and the back of my husband's Hufflepuff house sweater. Sleeve 1 is underway. I need to finish sleeve 1 by the end of the weekend if I am going to do sleeve 2 and finish the sweater before we go to see the last Harry Potter movie. Repeat after me: Sleep is a crutch for the weak. This spring I did the Red Line yarn crawl, and I spent most of my time (fine, all of my time) in the first two stores I went to: Stitch House and Windsor Button. At Windsor Button there was a yarn tasting. I had brought needles, and I tried many different skeins of yarn in this little column of Rowan-ness. The rep who was running the tasting had a free pattern, a double knit hat pattern using sock yarn. I think it is this hat (ravelry link), but I don't remember the pattern having ribbing, something you don't need to make in a double knit hat, because the stockinette naturally stays flat. Should I make the Double Layer sock yarn hat, or continue searching for the pattern (I theoretically have it somewhere in the house... heh)? Or maybe just wing it, making my own double knit hat? It's not like I haven't made double knit items before. Most of them have been flat, but that isn't a reason to not do it. I need to decide soon, because I signed up for the Puck This January 2011 Hat Trick. Three hats isn't impossible to do by any stretch of the imagination, but would be a lot easier if I had three hat patterns and yarns to make what I want (note, this is a yarn to pattern matching exercise, not a claim I don't have yarn with which to knit a hat. I'm not insane and I certainly have yarn). So, suggestions for hat patterns? I tend to wear beanies even if they make my hair look ridiculous when I get to work. But I have been tired enough that I've been going to work, walking the dog, and almost nothing else. Just enough knitting that I can see progress being made. I'm doing the Loopy Ewe's mini-challenge to make a short sleeve or sleeveless sweater by the beginning of July. They had a sale if you were buying yarn for the project, so I bought enough Dream in Color sock yarn to make this cute little shirred top. It's obviously pretty slow going if you are used to making sweaters with worsted weight. I'm working with the size 2 needles like my life depended on it, and getting an inch or so each day. I read a lot of web comics, though it used to be a lot higher. Most of the artists have twitter feeds (and some of them are definitely not safe for work). However, this video came up on one of them and it is safe for work provided your work doesn't mind parrots. Whee! I'm one of the biggest losers this week in Loser League. My fantasy football season is going down the tubes rather spectacularly as I'm trying to crawl my way into a playoff spot, but have to outscore my nearest competitor and win my next two games to do so. Umm, not going to happen. At least my loser season is going OK. This week my stream of football players tried their best to not score any points at all. If you want to know how a bad team is created, first you start with DelHomme. Dawson (Kicker) also does a good (or is that bad) job for me. I just know that bad is a good thing in my little neck of the woods. It's not all football around here. I have a head cold, which is irritating but not fatal so I am back to doing my normal stuff now after a day of rest. What I'm doing is finishing my second Red Scarf for the Orphan Foundation of America. It's really tempting to put tassels on it, but I think that might be too much for some people. I will have to resist! This scarf took me about 5 days with no work on it at all yesterday, so I think I have enough time to make a third one. I'm just out of red or reddish yarn unless I want to combine scraps of yarn from four different shades and three different weights. Not really going to happen. There should be a picture tomorrow though!